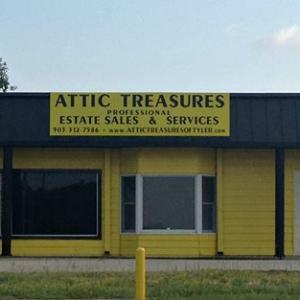 Attic Treasures is a family business that has been serving the Tyler area for over 15 years. We can conduct an estate sale in your home or, have the option to take to our auction house if there is not enough for a sale! We will help you from start to finish! Satisfaction Guaranteed! Large Estate Auction Starts April 2nd. @ 4:00 p.m. This is one sale you don't want to miss. Due to location of home, we have moved it to our store located in Tyler. More info will be added soon! Check out our photos! We have a very nice estate from The Woods Subdivision we have moved to our store for a 3 days sale! More info and photos will be added soon! Huge Christmas Sale w/ Madame Alexander, Annalee, Elvis, Steiff, Coke, Die Cast Cars, Franklin Mint and MUCH MUCH MORE! Anniversary Auction! Largest and BEST of the YEAR!! Estate Sale Chandler, TX Guns Sterling & MORE! Attic Treasures Estate Auction With Authentic Native American Indian Pieces & MORE! Large Estate Auction Starts Saturday June 20th.